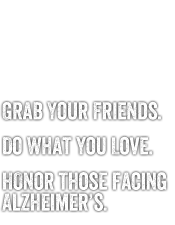 For Alzheimer’s. For Theatre. For my Mom. I’m an actor from San Francisco who came home for Christmas and stayed. My Mom is in Stage 4 of Alzheimer’s. My Dad is in denial, but he is getting better. I went to the Alzheimer’s Association and they gave me lots of support, ideas and the skills to move ahead. They also asked me to do The Longest Day, a 16-hour event to raise funds for Alzheimer’s support, care and research. I chose theatre. What was I thinking???? I was worried about my choice, but then I watched “Madagascar 3.” That’s right. You heard me. “Madagascar 3.” And I got all teary and emotional…but not when you would expect. It happened when they PUT ON A SHOW in a crazy, grandiose Cirque d’ Soleil way. I wept…..openly. And then I knew I had made the right choice. So, at 5 a.m. this morning, I got up to prepare for the day of theatre ahead of me. Thank goodness my pal Ian Smith in the United Kingdom did a comedy radio show in the wee hours. But, now it’s my turn. I’ve got to get down to the Mill Coffee Shop in the Haymarket of Lincoln, Nebraska, to meet my co-hostess Jessica West Bower for our morning talk show “Mornings Are a Drag.” Drag Queens are always late so I might be vamping a bit there. Then off to the Tada Theatre across the way for a day of show tunes and Chopin, sonnets, soliloquies and schtick. I have all ages signed up to perform for 16 hours and it will be open to the public. It is going to be an amazing day of making memories – memories that seem more important than ever before. One of my friends, Brendan Kelly, who is a fellow actor, stated in his donation comment box, “In support of live theatre everywhere and the healing the arts provide.” And that is why I am doing this: My mom gave me the support when I boldly stated I wanted to be an actor ,and it’s only fair I give back. The thought of keeping someone and their family from going through this would bring me so much joy and what better way to celebrate than by doing what has always given me the greatest joy in my life—performing. About the blog author: Todd Pickering is participating in Alzheimer’s Association The Longest Day®, a sunrise-to-sunset event on June 21, 2013, to raise awareness and funds for Alzheimer’s care, support and research. Well done you Todd , Happy you thought to give and remember what your wee mum did for you many yrs ago ..
She would be so proud of you Todd ..you tc and stay strong for times ahead , and of course for your Dad .